Dr. Janet Zoldan is assistant professor at The University of Texas at Austin in the Department of Biomedical Engineering. 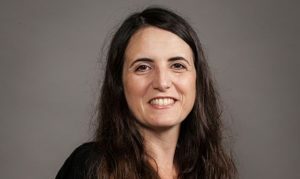 She received her master’s degree and Ph.D. in materials engineering from Technion-Israel Institute of Technology, after which she completed her postdoctoral training at the Massachusetts Institute of Technology. Zoldan is also Principal Investigator at The Zoldan Group, a research lab focused on human induced pluripotent stem cells (iPSCs) as a model system to explore key principles underlying tissue formation processes by integrating and applying materials and stem cell bioengineering. The Zoldan Group is a dedicated to further elucidating the effects of a stem cell’s microenvironment on the cell’s proliferation, migration, and differentiation. Utilizing a unique microfluidic device to deliver proteins into the cytoplasm of iPSCs, Zoldan Group researchers direct iPSC differentiation into cardiac lineages to develop safe, efficient, and robust production of patient-specific cell lines for cell replacement therapies and cardiovascular tissue engineering applications. The pluripotency of stem cells is used to create multi-cellular tissue-structures and induce tissue organization during cellular differentiation. Zoldan has been recognized as a Children’s Glaucoma Foundation Fellow, an Aly Kaufmann Fellow, and with a Katz Family Award for Outstanding Excellency. Her research is featured in numerous publications such as the Proceedings of the National Academy of Sciences as well as the international journal Biomaterials.